Assembled by Claire De Pauw and Marcel Stal, this collection contains over 800 ceramic and stoneware pieces created by Charles Catteau (1880 – 1966). These lovers of beauty had such an amazing flair for fine works that their collection became the worldwide reference for Charles Catteau’s work and the production of Boch Keramis during the Art Deco period. In homage to Marcel Stal, as well as to ensure the collection’s safeguard, protection and promotion, Claire De Pauw decided to donate it to the King Baudouin Foundation. In line with her wishes, most of the pieces in the collection can now be seen by the general public in the Keramis Centre and in the old studio of the Boch Keramis factory in La Louvière. Initially under the influence of Art Nouveau and then of Art Deco, Charles Catteau introduced new shapes, decoration and glazing at Boch Frères. He received numerous awards for the quality and aesthetics of his industrial creations, which combined both creativity and large-scale production whilst at the same time creating timeless pieces that continued to be produced for many years. During the Art Nouveau period, the idea that art should be accessible to as many people as possible became increasingly accepted. The primary objective was to add beauty to everyday life and to improve the lives of all sectors of the population. Charles Catteau adhered to this philosophy. 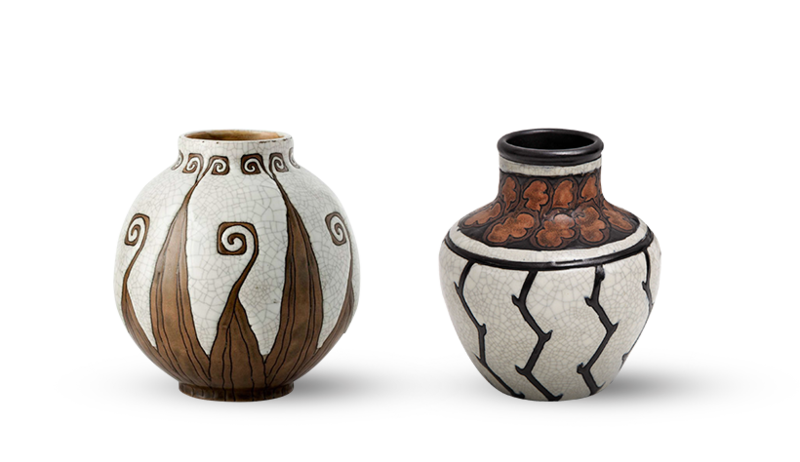 At the same time as standardisation was being made possible by industrialisation, Art Deco appeared and the ceramist immediately adopted the style in the service of the ceramics industry. Within the context of Art Deco, Catteau was on the lookout for innovation and fashionable effects. This is what led him to choose designs that were increasingly stylised, inspired by nature, and for vibrant and daring colours. He was also inspired by Japanese art, Africanism, Ancient Greece, Egyptian culture and avant-garde movements such as cubism, abstraction and the Ballets Russes.